​​After the tooth fairy has made a few visits to your home, you might notice that your child's pearly smile doesn't seem as white now that she has a few more adult teeth. This is because the top layer (enamel) of baby teeth is thinner and whiter than the enamel of adult teeth. Over-the-counter tooth whitening products such as whitening strips, trays and gels have exploded in popularity in recent years. But should children use them? 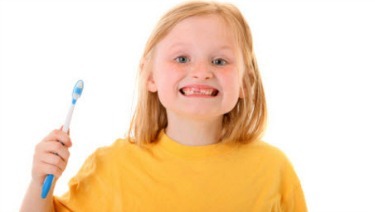 Pediatric dentists usually do not suggest bleaching until all baby teeth have fallen out. If using at-home bleaching products, parents should read the product label for recommended ages and instructions. Dark teeth can be caused by colas, dark juices, popsicles, coffee and other foods. A single dark tooth could be the result of an injury to the tooth, tooth decay or cavities. Children should visit a dentist for a routine checkup and cleaning every six months, according to the American Academy of Pediatrics. There, they can talk about whitening treatments. ​"I tell parents to hold off decisions about bleaching (until) after age 14, because all the baby teeth are gone by then and the adult teeth are fully erupted," said Martha Ann Keels, D.D.S., Ph.D.
​She suggests starting with an at-home kit with a low amount of bleach. "It is important to pay attention to the side effects and stop bleaching if the teeth start to be sensitive or the gums become irritated," she said. A dentist should examine an injured tooth that has turned dark or teeth with white spots and decide if in-office bleaching would work better than at-home products, she said. Before your child uses whitening products to improve how her teeth look, remember that the tooth color difference won't be as noticeable when all her adult teeth come in. ​"Once all the baby teeth are out, then the contrast with white color is gone and the permanent teeth do not look so yellow," said Dr. Keels. "I try to encourage accepting natural beauty over bleaching." Ask the Pediatrician: My son is 9 and brushes his teeth, but they are yellow. What can he do?